The orchestra in Mykanów was established in 1910. The initiator of its creation was Józef Pietrzyk. In 1998, Krzysztof Witczak became the conductor of the orchestra. From that moment, the dynamic development of the orchestra and the dominance of the band by school youth date. There were created: Children’s Brass Band, School of Wind Instruments and Percussion, and three groups of Majorettes, which present choreographic arrangements for music performed by the orchestra. The last decade is a systematic, a hard work, continuous development, and also a series of uninterrupted successes. The orchestra represented the Częstochowa district at international festivals in Friedrichshafen (Germany), Folklor Balkan Folk Fest (Bulgaria), Mosciano Festival (Italy), and at Differdange International Festival For Winds in Luxembourg. The orchestra performed at national and international sports competitions such as: The World Volleyball League, the Speedway European Grand Prix. Furthermore, the orchestra performed twice during the events promoting the Tour de Pologne race, and during the International Sailing Regattas in Szczecin in 2007. The orchestra played several times in Warsaw during the Final Concerts of the Great Orchestra of Christmas Charity in TVP studio, and also on the occasion of the 15th Anniversary of the Great Orchestra of Christmas Charity, taking part in a gala concert at the Buffo Theater. 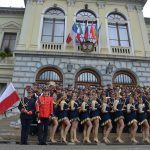 The many years of achievements of the Youth Brass Band at the Volunteer Fire Brigade in Mykanów were crowned with the title of Laureate at the 21st National Festival of Brass Bands in Krynica Górska in 2011. The bandmaster of the orchestra is Krzysztof Witczak, the majorette instructor is Ewelina Stolarska, and the drum major is Radosław Wochal.